The ViewBoard® IFP6560 is an 65” 4K (3840 x 2160) digital whiteboard feature InGlass™ technology delivers a more accurate and sleek touchscreen experience with lag-free writing and drawing in two colors with different thicknesses. Pairing ViewBoard® IFP6560’s 20-point touch display with pre-installed tools, such as vBoard for annotation, ViewBoard® Cast for content sharing, and Zoom conference software, allows multiple users to remotely write, share, and interact simultaneously. The built in Finger print recognition bolsters security and enables easy login to Windows or myViewBoard™ for your digital whiteboad in the cloud. The optional Intel certified OPS (Open Pluggable Specification) which allows users to switch their system to Windows OS. 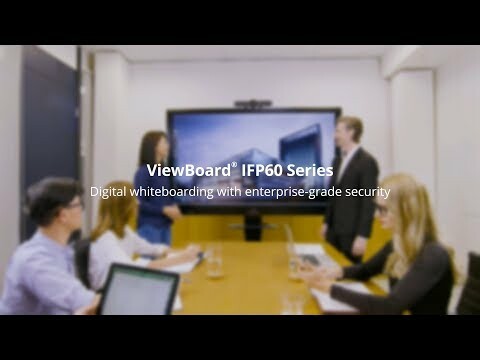 ViewBoard® IFP6560 is fit for integration into Google-based environments, offers seamless Windows accessories & office365 compatibility, comes equipped with Mac multi-touch gesture mirroring, and supports Linux PC touch back remote control. ViewBoard®’s built-in biometric recognition system is FIPS201 certified and prevents unauthorised users from accessing your account while also allowing you to login easily without having to type in your password. The front ambient light sensor detects and adjusts brightness level automatically depending on environment. When making annotations, the display dims the closer you get, to protect eyes from the panel; as you move further away, the display brightens. vBoard annotation supports dual pen writing with different colours & thicknesses for group brainstorming sessions. ViewBoard® automatically analyses for software upgrades whenever connected to the internet. With just one click, users can update their versions of ViewBoard® software. The two-sided toolbar offers shortcuts for navigating to the previous page, home page, vBoard, file explorer, pen annotation, screen capture, spotlight, and more. The toolbar stays hidden out of view while you use ViewBoard®; to reveal it, simply tap the sidebar button. Certified by the latest ENERGY STAR 7.1, ViewBoard® helps users save money and protect our climate through superior energy efficiency. USB SmartPort™ allows for USB data transmission between ViewBoard®’s front USB ports and the USB ports of slot-in PCs and connected laptops. This allows you to synchronise USB connection between your devices quickly and easily without swapping USBs. ViewBoard®’s built-in LAN port allows the connected network to link to the slot-in PC for easy connection. This allows you to insert the internet cable one time instead of switching between slot-in PCs. In addition to being wall-mountable, ViewBoard® can be paired with the motorised trolley cart for even more flexibility. The motorised trolley cart with a remote control offers height and tilt adjustment. *Max power consumption from OPS doesn’t over 60W.